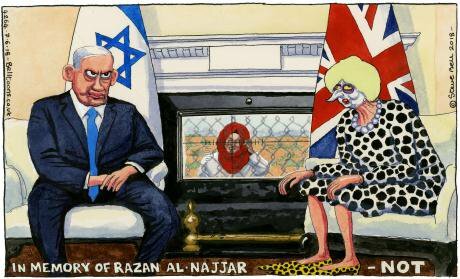 Steve Bell revised this cartoon to avoid causing unintended offence; more information here. 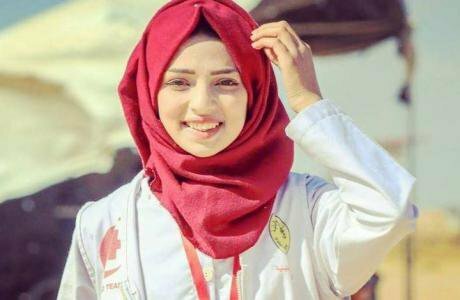 All rights reserved.Razan al Najjar was a 21-year-old Palestinian nurse volunteering with the medical crews attending protesters hit by Israel Defense Forces' sniper fire during the ten-week protests at the Gaza border. Called by the organisers the "Great March of Return", ("مسیرة العودة الكبري"‎), the protests were demanding that Palestinian refugees and their descendants be allowed to return to what is now Israel. They were also protesting about the blockade of the Gaza Strip and the moving of the United States embassy in Israel from Tel Aviv to Jerusalem. After giving an interview earlier that day, in which she said she took pride in the aid she was providing to the wounded, Najjar and her team of paramedics approached the border in white coats and with their hands in the air. She was fatally shot in the chest. According to The New York Times, on 1 June, "she ran forward to aid a demonstrator for the last time. Israeli soldiers fired two or three bullets from across the fence, according to a witness, hitting Ms. Najjar in the upper body. She was pronounced dead soon after…. On Saturday, a group of United Nations agencies issued a statement expressing outrage over the killing of 'a clearly identified medical staffer,' calling it 'particularly reprehensible.'" Violence during the protests has resulted in the deadliest days of the Israeli-Palestinian conflict since the 2014 Gaza War. The Israeli military say that the investigation into al Najjar's killing will continue, and accuse Hamas of putting civilians in danger.